I am honored to be with you today. And I am humbled to stand before you and speak about what it means to be an American. I’ve had the privilege of speaking to many groups in my career. But I must tell you, few occasions have been more moving that this one. Many of your families are here today to celebrate with you. Welcome to all of you and thank you for all you’ve done to support these new citizens! You most definitely deserve a round of applause. And because this is such an important occasion, I’m proud to tell you that my family – my wife and mother – are with me today to share my experience in honoring you. I am especially delighted that we have students from Marburn Academy here with us today. I have the honor of serving as chairman of the board for this fine school and I’m so proud that they are here learning about citizenship and celebrating this momentous occasion with you. Few of us can fully appreciate the journey you’ve been on and the paths you’ve travelled. But we know it hasn’t been easy. You’ve left family and loves ones behind. Left the lives you’ve known. Came to a nation where you may not have spoken the language or known the culture. But you’ve persevered. You have been on a remarkable journey. Regardless of how you arrived – by air, land or sea – you got to this place today. A place of prominence. A place of dignity. A place of honor. The place where you’ve become an American. Unlike you, my American story is pretty commonplace. I grew up in a small town in Northeastern Ohio. I had a comfortable childhood, a stable family, decent schools and endless opportunity. I used to think that was pretty ordinary. Certainly, in contrast to your journey, it is. But as I’ve grown older, and seen more of the world, I’ve come to believe both our stories are, actually, quite extraordinary. I’m an American by birth. You’re an American by choice. But we are both citizens of the most extraordinary nation the world has ever known. It’s extraordinary not because of the natural resources we have, the prosperity we’ve created, or the power of our military might. It’s extraordinary because of who we are as a people, the ideals we hold dear, and because you and I – regardless of how we got here – control the destiny of America. Think about that – we control the destiny of America. Earlier this month, we held elections. And as we’ve all witnessed, government and the conduct of our democracy can be chaotic, complex and sometimes even downright dysfunctional. But it has produced the greatest nation in the history of the world. It’s because we make the government. Our government leaders derive all their power from us. If we don’t like how their using that power, we hold the power to change it. As an American, I’ve been blessed to participate in this messy democracy in many ways. I’ve run political campaigns, served in key positions in federal and state government, and had plenty of opportunities to share my thoughts with presidents, senators, congressmen, governors and other leaders. You see, my ordinary upbringing gave me some extraordinary opportunities. I’ve treasured each one of them. You know, our politics today is divisive. Maybe more divisive than ever. In many ways, our public discourse has become rawer, personal, full of spite. Even vengeful. But it doesn’t have to be this way. Just because we may disagree doesn’t mean we’re enemies. 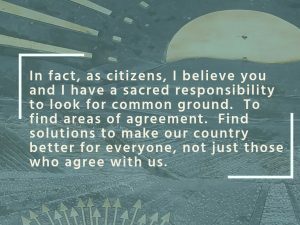 In fact, as citizens, I believe you and I have a sacred responsibility to look for common ground. To find areas of agreement. Find solutions to make our country better for everyone, not just those who agree with us. I’m a Republican. Always have been. Probably always will be. All the government jobs I’ve had have been through appointment by Republican officeholders. Our presiding officer today, the Honorable Algenon Marbley, was appointed by a Democratic President. The Judge and I have very difference backgrounds; very different philosophies. I would suspect that Judge Marbley and I disagree on political issues probably 90% of the time. But there is no finer American than Judge Marbley. He’s devoted his life to public service, the rule of law, doing what’s right. And he always treats people with civility and respect. Thank you Judge Marbley for your service to our country! My family and I have been fortunate to travel the world a fair amount. From Europe to Central America to East Asia, we’ve experienced other nations, seen how their people live, and gotten a sense of their values. This past summer, we traveled to Germany and the Czech Republic. I’ll admit — we ate a lot of schnitzel and drank our share of beer. It was a great trip. But we also visited a Nazi concentration camp. Saw the gas chambers where tens of thousands of Jews were put to death. Visited memorials honoring even more Holocaust victims and survivors. And we saw the sites where bombs rained down outside Dresden and Prague in World War II. For us, these were the stark reminders of the unspeakable horror that man can inflict upon fellow man. And the fact that evil has – and can again – exist in our world. But we’ve also visited where American men and women, along with their counterparts in the Allied Forces, liberated those enslaved by evil and restored liberty to a free loving people. Think about the sacrifices those people, those Americans, made. These brave souls, many of whom did not return, left their loved ones behind to fight on foreign soil so that we could have freedom on our own. They lived their own uniquely American story. And they made our world a better place for the generations which followed. Now America has not always lived up to our own ideals. The treatment of Native Americans, the dark history of slavery, the internment of Japanese and Japanese Americans in the ‘40’s, and the more recent struggle for civil rights for all, show us that we too must be ever vigilant in not succumbing to fear, and anger and prejudice. That too is a sacred responsibility each of us holds as citizens. For 242 years, the United States has stood strong as a beacon of liberty and freedom. And unless you’re a direct decedent of Native Americans – which very few of us are – our forbearers were all immigrants at some point. Like some of you, they arrived with little more than the clothes on their backs, and the hope of a better life in America. And most found it here. But also, like many of you, they made America better by living their lives here. They worked, dreamed, raised their families, and contributed to our civic good. Many of the names are well known – Albert Einstein, Joseph Pulitzer, Levi Strauss, Henry Kissinger, Bob Hope, Madeleine Albright, Alfred Hitchcock, Sergey Brin and the list could go on and on. But so many more are not famous. We’ve never heard their names. We’ll never know their story. But we do know that they lived their lives here and by so doing, added strength, resiliency and a rich texture to our social fabric. Here in Ohio, immigrants make up about 4 percent of all residents, and a similar number – over half a million Ohioans – are native-born Americans who had a least one parent who was an immigrant. The top countries of origin for immigrants now in Ohio are India, Mexico, China, Germany and Canada. I’m pleased to see many of these nations represented here today. According to a study by Cleveland State University, Ohio is the most educated state in the nation for immigrants with 42% of immigrants having at least a four-year college degree. Many of these new Ohioans contribute to our economy as entrepreneurs, scientists, business leaders and medical professionals. Immigrant-led households in Ohio pay more than $3 billion in federal taxes, more than $1.3 billion in state and local taxes, and contribute $11 billion of spending power to Ohio’s economy. Make no mistake about it, Ohio is stronger today because of the immigrants that came before you, and we need your help to grow stronger in the future. As I said, I grew up in Middle America born with all the opportunity this nation could offer. And today, each of you has the exact same rights, privileges, opportunities and responsibilities that I have. That is the beauty of America. Like Judge Marbley, I chose to devote a portion of my life to public service. I hope you will consider doing so as well. You don’t have to become a judge – although you can. You don’t have to work in government – although you can. And you don’t have to chair a school board – although you can. You can serve your fellow citizens by volunteering in your church or community center. You can give back though a charity of your choice or helping the next immigrant to become a U.S. citizen. You can participate in our democracy by using your voice and your vote. This is the right and the sacred responsibility of every American citizen. And so, on this day, a day of celebration and achievement, I congratulate you on becoming citizens of the greatest nation on Earth. And I ask each of you to use your rights and responsibilities to live your better life and make the United States of America a better place for generations to come.